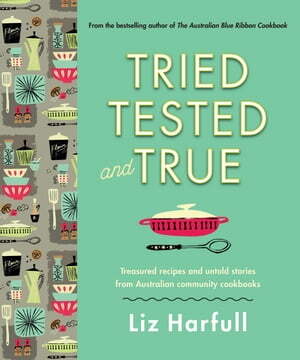 Collins Booksellers - Tried, Tested and True by Liz Harfull, 9781760635947. Buy this book online. Forget celebrity chefs. The books that truly reflect what most Australians cooked and ate at home for decades were put together by people you have never heard of, all in the name of helping others. Community cookbooks have raised millions of dollars for Australian charities and causes, ranging from cash-strapped local schools and churches to international movements like Variety and the Red Cross. Many of these books were humble publications, hand-printed and stapled together by volunteers. But some, like the iconic PWMU Cookbook from Victoria, the Green and Gold Cookery Book in South Australia, the CWA's Cookery Book and Household Hints from WA and the Bundaberg CWA branch cookery book from Queensland, have outlived fleeting food fads, and are still in print and much-used today. Tried, Tested and True: treasured recipes and untold stories from Australian community cookbooks celebrates this amazing tradition. Based on extensive original research, best-selling author and Gourmand World Cookbook award-winner Liz Harfull brings to light previously untold stories about the cookbooks and the people who created them. Featuring carefully selected recipes, updated with additional tips and hints to ensure success for the most inexperienced modern cook, Tried, Tested and True is a treasure trove for your kitchen.